This theme fully supports Android 7.1.1& it works without TBO Theme ready gapps! Please read the FAQ before installing. 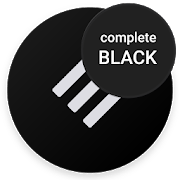 Swift Black Substratum is a theme for the Substratum Theme engine. It comes with a big number of themed apps, great support and frequent updates. The Substratum app will display a warning message about using themes on a 7.1.1 device. You can ignore this warning when using this theme as it have full support for this version. Reboot after applying, and If you use rootless Oreo and March security patch or higher you need to follow the instructions in the dialog that shows when you open the theme in Substratum. • Updated theme for Google Calculator, Calendar, Instagram, Snapchat and a bunch of other fixes!